Warp Transform is a GEGL based brush-like tool which replaces the old iWarp filter and works directly on the image, on real things instead of a tiny preview window. You can use an erase mode to partially remove warping you applied. You have available options to adapt strength and size of warping. or by clicking on the W keyboard shortcut. 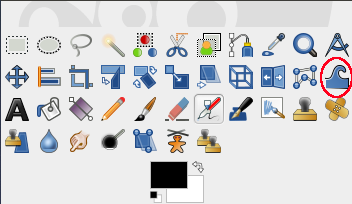 The available tool options can be accessed by double clicking the Warp Transform tool icon in toolbox. An interpolation method is used during warping. See Interpolación for a description of these methods. Move pixels is the default method. Clicking 5 times at the center of the image with brush size = image size. Swirling clockwise the whole image (brush size = image size) with a circular movement of the brush. Size : the size of the brush is increased. Hardness : TODO (work in progress). Strength: set displacement of pixels during warping. The maximum of displacement is on the brush diameter. “Abyss” is a term used by GIMP developers for “data outside the input buffer”. The warp tool moves pixels from one point to another. Some pixels may come from outside the layer boundary. These pixels don't actually exist anywhere, and therefore don't have any associated color; yet, some color must be assigned to them. None: this is the default option. Empty areas are transparent. An alpha layer is necessary for this option. Clamp: each edge of the transformed layer stretches out indefinitely, so, for example, a pixel to the left of the layer boundary has the same color as the leftmost pixel of the layer with the same y coordinate. An alternative way to think of it is that each pixel outside the layer boundary has the same color as the closest pixel inside the layer boundary. Loop: the transformed layer repeats itself in all directions, so that, for example, falling off the right edge of the layer takes you back to the left edge. Black, White>: these options are similar to "none", but use black and white for out-of-bounds pixels, instead of transparency. “preview” is the image window, where you work, before pressing Enter to validate the transformation. With this option checked, preview is more accurate, but slower. This option allows you to generate several intermediate images between the original image and the final deformation of this image. Frames to set the number of frames in this animation. Create Animation button: to create the animation. A new image window is created. Export it as a GIF image, checking the As animation option in the export dialog.